Fundamentally risk is subjective; it is not possible to dispassionately define what level of risk is acceptable and what is not. Any two risk scenarios are inherently different from one another due to people’s inherent understanding and acceptance of different types of risk. The subjective component of risk becomes even more pronounced when the perceptions of non-specialists, particularly members of the public, are considered. Hence successful risk management involves understanding the opinions, emotions, hopes and fears of many people, including managers, workers and members of the public. It is necessary to have a clear understanding as to what levels of risk are acceptable. After all, if a facility operates for long enough, it is certain - statistically speaking - that there will be an accident. Yet, given that real-world targets are needed for investing in Process Safety Management (PSM), a target for "acceptable safety" is needed. This is tricky. Regulatory agencies in particular will never place a numerical value on human life and suffering because any number that they propose would inevitably generate controversy. Yet working targets have to be provided, otherwise the facility personnel do not know what they are shooting for. Nor can a regulatory body, a professional society or the author of a book such as this can provide an objective value for risk. Yet individuals and organizations are constantly gauging the level of risk that they face in their personal and work lives, and then acting on their assessment of that risk. For example, at a personal level, an individual has to make a judgment as to whether it is safe or not to cross a busy road. And there is the further complication of the subjectivity of risk. Someone who is strongly opposed to having a chemical plant near their home may happily choose to go bungee jumping at weekends. In an industrial context managers make risk-based decisions regarding issues such as whether to shut down an equipment item for maintenance or to keep it running for another week. Other risk-based decisions made by managers are whether or not an operator needs additional training, whether to install an additional safety shower in a hazardous area, and whether a full Hazard and Operability Analysis (HAZOP) is needed to review a proposed change. Engineering standards, and other professional documents, can provide guidance. But, at the end of the day, the manager has a risk-based decision to make. That decision implies that some estimate of "acceptable risk" has been made. One company provided the criteria shown in the Table for its design personnel. Their instructions were that risk must never be in the 'intolerable' range. High risk scenarios are "tolerable", but every effort must be made to reduce the risk level, i.e.,to the "broadly tolerable" level. The Third Law of Thermodynamics states that it is impossible for any system to reduce its entropy to zero in a finite number of operations. A safety incident is an example of a system that is not in a zero entropy state, i.e., one that is not perfectly ordered. And this idea makes sense. No person is perfect, no organization is perfect. No matter how much time, effort and money and goodwill we spend on improving safety, incidents will occur. The third law holds. Indeed, the data shown in the chart suggest that safety trends offshore have reached an asymptote. 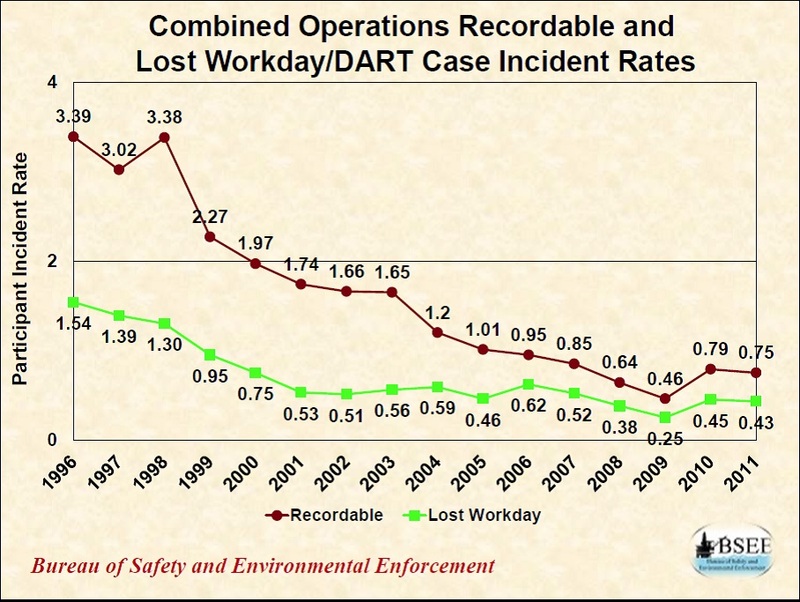 The data, which were published by the United States Bureau of Safety and Environmental Enforcement (BSEE), show a steady improvement from the mid-1990s to the year 2008. But since then there seems to have been a leveling out. Whether this trend will continue is to be seen, but it does suggest that some type of limit may have been reached. Looked at in this light, perfect safety can never happen. Nevertheless we should strive toward it because otherwise we accept that people will be injured - which is something that none of us want or accept, and we certainly do not want to quantify (although a goal of zero incidents over a specified time frame may be achievable). Although perfect safety may not be theoretically achievable, many companies will use slogans such as Accidents Big or Small, Avoid them All. The idea behind such slogans is that the organization should strive for perfect safety, even though it is technically not achievable. Whether such slogans have a positive effect is debatable. Many people view them as being simplistic and not reflecting the real world of process safety. They seem to over-simplify a discipline that requires dedication, hard work, education, imagination and a substantial investment. For example, a large sign at the front gate of a facility showing the number of days since a lost-time injury is not likely to change the behavior of the workers at that facility. Indeed, it may encourage them to cover up events that really should have been reported. Or to be cynical about the reporting system. Some risk analysts use the term 'As Low as Reasonably Practical (ALARP)' for setting a value for acceptable risk. The basic idea behind this concept is that risk should be reduced to a level that is as low as possible without requiring "excessive" investment. Boundaries of risk that are definitely acceptable or definitely not acceptable are established as shown in the chart, which is an FN curve family. Between those boundaries, a balance between risk and benefit must be established. If a facility proposes to take a high level of risk, then the resulting benefit must be very high. Risk matrices (discussed below) can be used to set the boundaries of acceptable and unacceptable risk. The middle squares in such a matrix represent the risk levels that are marginally acceptable. One panel has developed the following guidance for determining the meaning of the term As Low as Reasonably Practical. Exposure of employees to a low level of risk. The fundamental difficulty with the concept of ALARP is that the term is inherently circular and self-referential. For example, the phrase "best available technology" used in the list above can be defined as that level of technology which reduces risk to an acceptable level - in other words to the ALARP level. Terms such as "best operations" and "high standard" are equally question-begging. Another difficulty with the use of ALARP is that the term is defined by those who will not be exposed to the risk, i.e., the managers, consultants and engineers who work safely in offices located a long way from the facility being analyzed. Were the workers at the site be allowed to define ALARP it is more than likely that they would come up with a much lower value. Realistically, it has to be concluded that the term ALARP really does not provide much help to risk management professionals and facility managers in defining what levels of risk are acceptable. It may be for this reason that the United Kingdom HSE (Health and Safety Executive) chose in the year 2006 to minimize its emphasis to do with ALARP requirements from the Safety Case Regime for offshore facilities. Other major companies have also elected to move away from ALARP toward a continuous risk reduction model (Broadribb 2008). The notion of de minimis risk is similar to that of ALARP. A risk threshold is deemed to exist for all activities. Any activity whose risk falls below that threshold value can be ignored - no action needs to be taken to manage this de minimis risk. The term is borrowed from common law, where it is used in the expression of the doctrine de minimis non curat lex, or, "the law does not concern itself with trifles". In other words, there is no need to worry about low risk situations. Once more, however, an inherent circularity becomes apparent: for a risk to be de minimis it must be 'low', but no prescriptive guidance as to the meaning of the word 'low' is provided. Citations from regulatory agencies provide some measure for acceptable risk. For example, if an agency fines a company say $50,000 following a fatal accident, then it could be argued that the agency has set $50,000 as being the value of a human life. (Naturally, the agency's authority over what level of fines to set is constrained by many legal, political and precedent boundaries outside their control, so the above line of reasoning provides only limited guidance at best.) Even if the magnitude of the penalties is ignored, an agency's investigative and citation record serve to show which issues are of the greatest concern to it and to the community at large. With regard to acceptable risk in the context of engineering design, a term that is sometimes used is 'Recognized and Generally Accepted Good Engineering Practice' (RAGAGEP). Some companies and industries use indexing methods to evaluate acceptable risk. A facility receives positive and negative scores for design, environmental and operating factors. For example, a pipeline would receive positive points if it was in a remote location or if the fluid inside the pipe was not toxic or flammable (Muhlbauer 2003). Negative points are assigned if the pipeline was corroded or if the operators had not had sufficient training. The overall score is then compared to a target value (the acceptable risk level) in order to determine whether the operation, in its current mode, is safe or not. Although indexing systems are very useful, particularly for comparing alternatives, it has to be recognized that, as with ALARP, a fundamental circularity exists. Not only has an arbitrary value for the target value to be assigned, but the ranking system itself is built on judgment and experience, therefore it is basically subjective. The biggest benefit of such systems, as with so many other risk-ranking exercises, is in comparing options. The focus is on relative risk, not on trying to determine absolute values for risk and for threshold values.